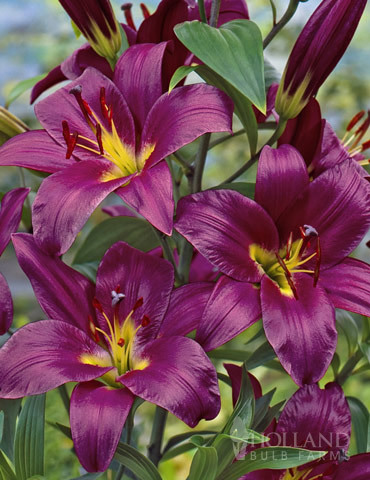 Let royalty grace your garden with the Purple Prince.Large purple (up to) 8" diameter blooms will adorn this statuesque, wonderfully fragrant tree lily that has strong sturdy stems that do not require staking! This tree lily will generally grow 3-4' the first year, and up to an amazing 6-8' at maturity! You can expect 20-30 flowers on each plant by the third growing season! Great choice for naturalizing, vertical accent or back of the border plant! Plus with this regal beauty is EASY TO GROW! I hope that this bulb grows and blooms as well as the bulb looked upon arrival. It's a joy when your order arrives looking as well as this order. Received large quality bulbs in my order. If the bulbs are any indication of the health and vigor of the plants, they will be fantastic. I ordered Purple Prince Orienpet lilies and they arrived as scheduled. The bulbs appear healthy, so we'll see how they grow next spring. Zone 5A. This is the first time I plant the purple lilies, and I don't expect to be disappointed. I love the rich colors in the picture and I am sure they will be just as vivid once they start to come up this year. I have yet to be disappointed with any of the Holland Bulb products.